One of the RustyButTrusty parts runners – the new car that enables all the old car fun – is a VW fitted with the now-infamous TDI engine. Without excusing VW’s actions, a recent article on defeat devices exposed some interesting facts about the history of these cheats and their employment since the early days of emissions systems. Interestingly, while VW was slapped on the wrist 42 years ago for employing such devices on their cars, manufacturers including GM, Ford, Chrysler, American Motors, Nissan, and Toyota, in addition to various semi-tractor manufacturers, have all been caught using work-arounds to get their cars past the EPA while maintaining othe rthings consumers care more about, like power, drivability, and fuel mileage. 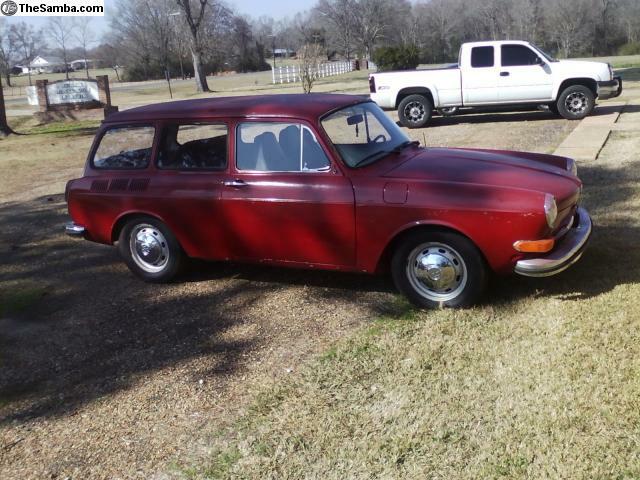 So for an early example of an emissions-cheating car, let’s take a look at this 1973 VW Type 3 Squareback, for sale for $2495 in Deville, Louisiana. It’s surprisingly hard to find a decent driver example of a 1973 Type 3 or Bus, at least under the $4000 price cap, but of course there are plenty of other years in which these were manufactured. This one looks in decent condition, though it’s missing its beltline trim. Given that and the shiny red paint, you’ll want to check carefully for rust. According to the seller, the body is good, while the pans have some rust. The car looks pretty clean overall, but the lack of a license plate suggests it’s been off the road for a while. Oddly, the Volkswagen script on the rear is painted black, though none of the other trim is. This is a pretty smart looking little wagon, though it lacks some of the delicate details of the cars pre-dating the 1970 facelift. Things look like they’d do well with a simple clean-up inside. Those lower vents are the remnants of a dealer-installed air conditioning system, but there is no compressor under the hood trunk floor. 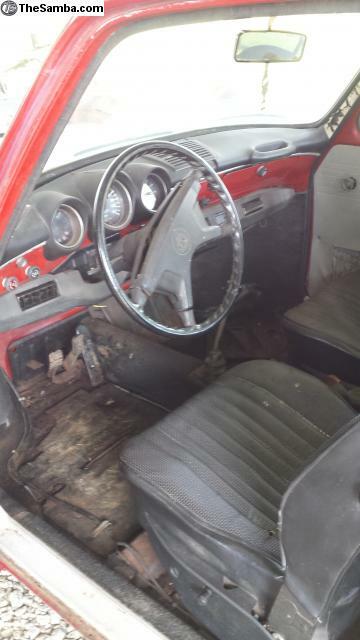 The floor pan rust is not visible on this picture, so good on the seller for disclosing that up front. The engine looks to have received some recent work, including dual 34 carbs (converted at some point from the original D-Jetronic), a new centrifugal distributor, fuel pressure regulator, and wheel cylinders. The car also comes with a new windshield rubber, so check up there for rust. Plug wires look new as well, but it’s worth asking how recently the work was done since the car appears to have been parked for a while. 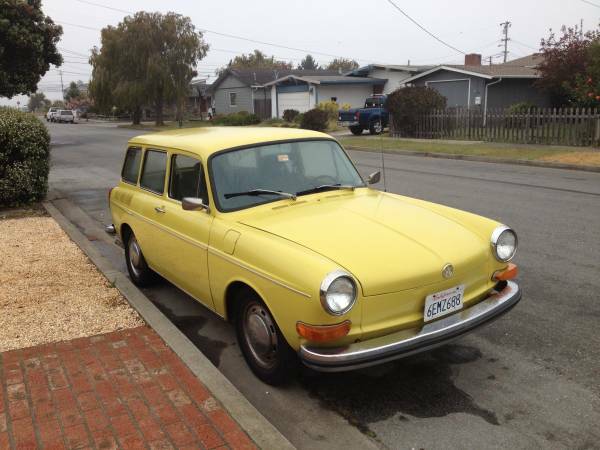 If the emissions history scares you off, or you’re not into red, how about this 1972 VW Type 3 Squareback for sale for $4000 in Pescadero, CA? 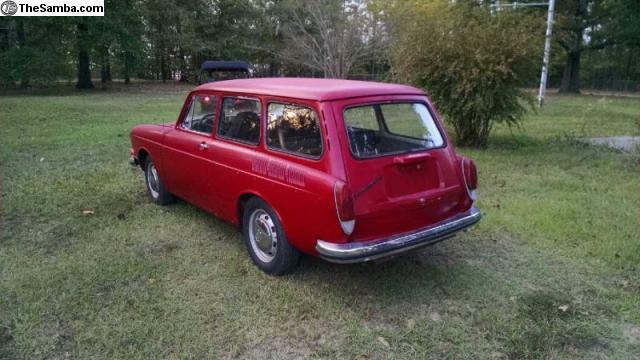 The car looks original, and was the seller’s first car when he was 16 (though it’s not clear how long ago that is). It’s said to be in excellent driving condition but needs some light cosmetic work due to its seaside location. Unfortunately, not many other details are given, but the sole picture seems to indicate a decent driver. 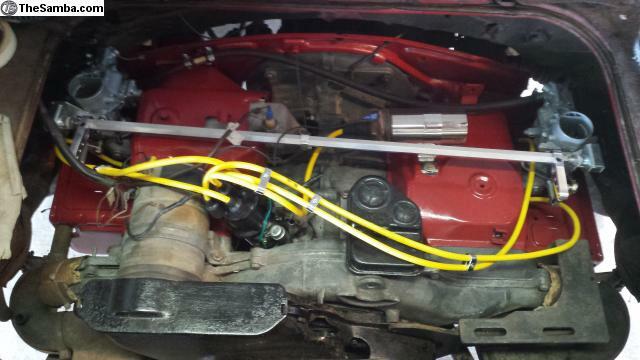 If this isn’t your thing, stay tuned for more cars that won’t pass a modern smog test. This entry was posted on October 22, 2015 at 11:04 am and is filed under Feature. You can follow any responses to this entry through the RSS 2.0 feed. You can leave a response, or trackback from your own site. Even in California, no smog check would be necessary for either of these cars (only 1976 and later cars need to be smogged). Is that not the case in other states as well? Oops, didn’t mean to suggest that would be anything more than an imaginary concern at this point. Just like the new cars, a defeat device would allow you to get through any smog test (assuming everything else is in good shape) so you should be fine in any state. VW settled out of court without admitting any wrongdoing, so it appears there wasn’t even a recall.